First light on Anai Mudi, the highest mountain in peninsular India south of the Himalaya, as seen from the Palani Hills. This post highlight themes of biodiversity and landscape in the Palani Hills that were taken during our family’s winter visit. In particular, I focus on two species that I had the good fortune to encounter. Nilgiri tahr (Nilgiritragus hylocrius), a species endemic to the southern Western Ghats, were once found in significant numbers along the escarpments of the Palani Hills. The populations of Nilgiri tahr dropped precipitously in the 19th and 20th Century when they were shot for sport, poached and then affected by large-scale habitat change as a result of afforestation schemes on the montane grasslands that they depend on. I have spent significant time in the Palanis exploring their habitat and looking for signs that tahr still survive. And they do, though it is hard to say exactly how many there are. The most recent comprehensive survey was conducted by WW-India. Their 2015 report linked blow highlights issues of distribution and conservation in the entire range. 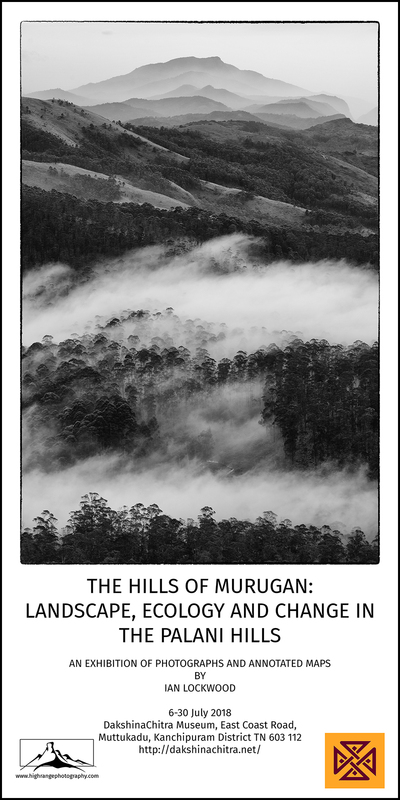 Douglas Hamilton’s “the old buck of Kodaikanal.” In a Record of Southern India (see online links) he describes shooting this near to what is known as Priests Walk- a place on the outskirts of the Kodaikanal municipality and just below the infamous Ponds thermometer factory. The image is sourced from the British Library via Wikipedia (referenced below). See the well-documented Wikipedia entries on Douglas Hamilton who was one of the first people to document Nilgiri tahr in the Palani Hills and other neighboring locations (Anamalais and High Range). His sketches and narratives provide rich evidence of Nilgiri tahr in the hills before the changes of the last 150+ years. Much of the work on the Wikipedia pages is thanks to the efforts of Marcus Sherman who has found online sources and made these contributions as an editor of Wikipedia. Nilgiri tahr adult female and juvenile on the escarpment near Kukkal. I’ve been seeing tahr here for the last 10 years or so but I have not been able to get close enough for a photograph. I spotted this pair with Lenny and Prasen on a short visit in January. We were able to hunker down in the grass as they approached unaware of our presence. Once got wind of us (it might have been Lenny’s bright red jacket?) they reversed their direction and descended quickly back the slope. The original images was taken with a D-800 and 600 f/4 Nikon ED VR lens mounted on a tripod and the inset shows the detail of the adult’s head. The lens is an amazing tool to use, albeit a bit heavy and bulky but it produces superior results. The Black & Orange flycatcher (Ficedula nigrorufa) is an endemic bird from the central and southern Western Ghats and is closely associated with the densely wooded forest patches of shola/grasslands systems. There are healthy populations of these flycatchers in and around Kodaikanal and they have even adapted themselves to gardens. After several fruitful days of wandering in Bombay shola I had followed several different individuals and been able to record them in a variety of different situations. This male was photographed in Bombay Shola, a small forest located in the busy hill station of Kodaikanal. It was taken during a magical encounter with several endemic shola bird species while in the company of my cousin Peter Lockwood and friend Prasenjeet Yadav. I’m still adjusting to using a long lens and this is one of the first pictures that it has produced that does some justice to a beautiful, yet secretive bird that is generally found in dark thickets of undergrowth in the shola. The image above is currently showcased in Sanctuary Asia’s April 2016 edition (see pages 12-13). Alongside it are images from photographer friends Kalyan Varma, Gertrud & Helmut Denzau and Ashok Captain. Log into www.Magzter.com to get a subscription and read the whole issue. There were, of course, many other birds in the sholas and I’m slowly building up a record of shola aviafauna. Shola bird species diversity in Kodaikanal’s Bombay Shola. Clockwise from upper left: Indian Scimitar Babbler (Pomatorhinus horsfieldii), Grey Breasted Laughing Thrush re-named as the Kerala Laughing Thrush (Strophocincla fairbanki), White Bellied Shortwing now known as the White Bellied Blue Robin (Myiomela albiventris), Grey-Headed Canary Flycatcher (Culicicapa ceylonensis) and Nilgiri Flycatcher (Eumyias albicaudatus) female. North-west edge of the Palani Hills looking north-west to the Anamalais and beyond. “Drawings by Douglas Hamilton.” Wikipedia. Web. 2 April 2016. Lockwood, Ian. “Of Tea & Tahr.” Sanctuary Asia. June 2000. Print & Web. Lockwood, Ian. 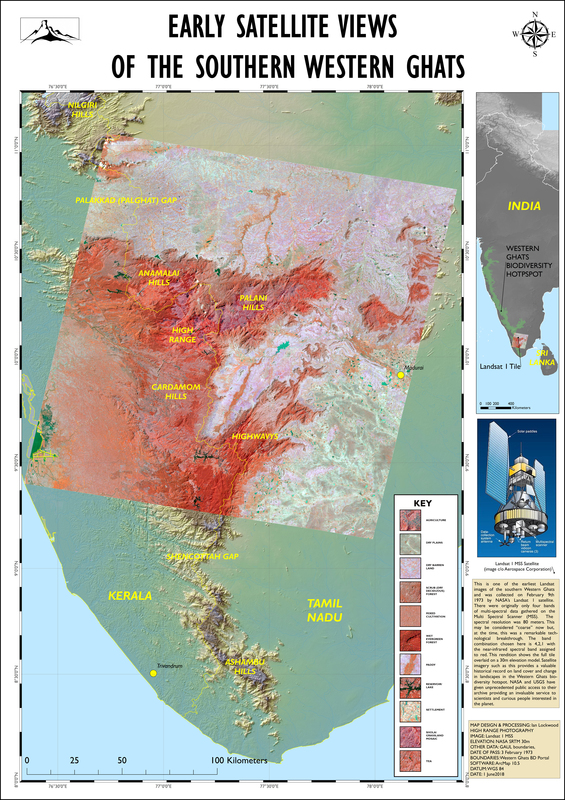 “On the Southern Rim of the Palanis (Part II).” Ian Lockwood Blog. September 2011. Web. Lockwood, Ian. “Renewal in the High Range.” Ian Lockwood Blog. September 2014. Web. Predit, Paul Peter et al. 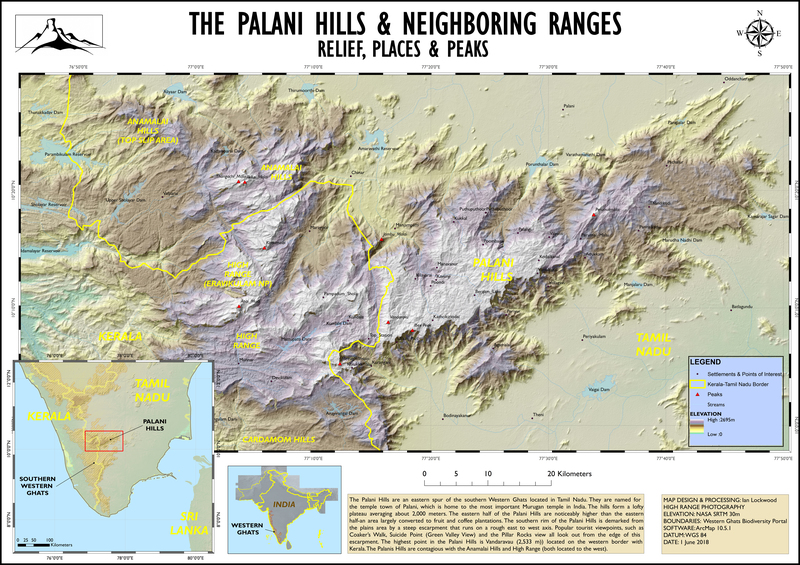 Status and Distribution of the Nilgiri Tahr in the Western Ghats, India. WWF. New Delhi, 2015. Web. 2 April 2016. Rasmussen, Pamela C and John Anderton. Birds of South Asia” The Ripley Guide: Volumes I&2. Second Edition. Smithsonian: Washington DC, 2012. Print. “Saving the Unique Mountain Ungulates of the Nilgiris.” WWW India. December 2015. Web. 2 April 2016.